Over the weekend we met up with some friends to cheer on California Chrome…womp, womp! While the thoroughbred came up short, the appetizer I brought to share was certainly a crowd-pleaser. Living in South Philadelphia, not far from the Italian Market, I’m fortunate to have Di Bruno Brothers at my disposal. Di Bruno Brothers has been serving up gourmet goodness since 1939 and are well-known for their exceptional cheeses, meats and other Italian specialities. I picked up a few simple ingredients: marinated mozzarella, roasted red peppers, salami, Roman artichokes, and pitted Kalamata olives – then I got to work! Simply assemble ingredients on wooden skewers and violà….the easiest appetizer ever! Easy to pick up and eat, each skewer is exploding with flavor. And the best part – they can be made in advance and you can easily find all of these ingredients at your local supermarket. Em, I just love to read what you have to offer regarding all of these tricks and trades to preparing so many foods that you recommend making it simple instead of hard!. Recently, I used your Sangria recipe, baked your banana chocolate chip muffins (after I sampled them before my flight – yummy! 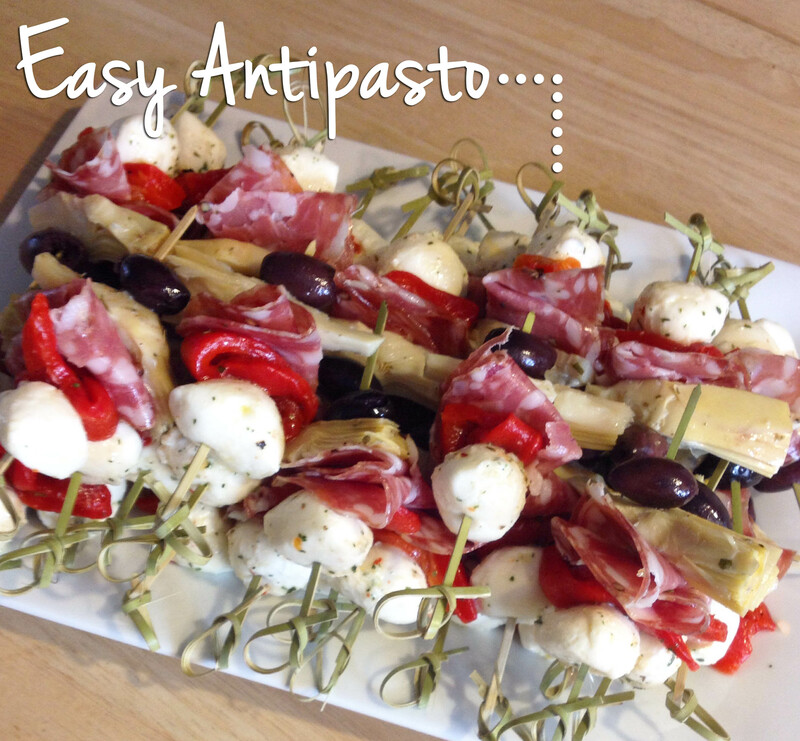 ), and now will try out these appetizers…called easy antipasto at my next gathering! Anyone who is just starting with married life, or even a young single, who entertains would benefit from you blog. You write like you talk. Since I know you, I can almost hear your voice while I’m reading these great articles. I’ve been following you since Jay let me know that you had a blog…and I just love it! I know it must be hard, but keep up the writing, you have no idea how great you come across!